There’s a cool edge to this album. There’s a lot going on instrumentally, lots of layers. 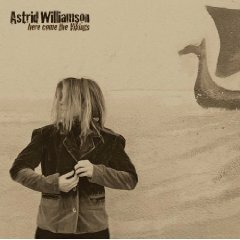 And Astrid Williamson’s cool voice grumbling and cooing over all. While this album is really diverse, ranging from alternative rock to pop most of it is more rock oriented than others I’ve heard recently. At least track #1 is. There are wailing guitars and frenetic percussion. Sing the Body Electric is more pop. In fact, it’s downright radio friendly with tinkly piano and everything. Eve really shows her vocal ability. It sounds clear and lovely here. She has a very mature sounding voice. It’s got a kind of a deep quality. Slake is really cool, it’s already made it onto one of my Car Mixes. I like that it’s got some haunting talking sprinkled throughout. The Stars Are Beautiful is maybe my favorite and a lovely way to end this record. This is a really great album. It’s diverse, catchy, and mature without being snobby or pretentious. It’s going in my personal rotation for some time to come.